Manama beat Riffa Club 7-5 in the final to win the Angel Women's Basketball 3on3 Championship yesterday at Zain Basketball Arena in Um Al Hassam. The championship was held under the patronage of Bahrain Basketball Association (BBA) president Shaikh Isa bin Ali Al Khalifa, and organised by Angel Sports Events in cooperation with BBA. 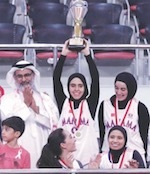 Muharraq Club won the bronze medal after defeating Al Najma in the battle for third place. Mohammed Kuwayed won the three-point shooting contest held during the event. Others who took part included Bahrain basketball stars Mohammed Kuwayed, Hussain Shaker, Ahmed Aziz, Ahmed Al Derazi, Subah Hussain, Maitham Jameel and Bader Abdulla. PAOK Thessalonikis (A1) landed 28-year old Bahraini international forward Brittany Lewis (188-89, college: Louisiana Tech). She has a double citizenship as she also holds American passport. Lewis played most recently at SBK Samorin in Slovakian Extraliga. In 13 games she averaged 10.8ppg, 7.4rpg and 1.5bpg in 2015-16 season. She helped them to make it to the semifinals. Lewis also played 1 game in CEWL where she had 12 points, 2 rebounds, 1 assist and 1 block. The previous (14-15) season Lewis played at Ferko Ilgaz in Turkish KBSL. In 12 games she recorded very impressive stats: 17.3ppg, 9.9rpg, 1.2apg, 2.5spg and 1.1bpg. Lewis received All-WAC 3rd Team award back in 2013 at her college time. Lewis was called to Bahrain Senior National Team this year. She has played also professionally in Turkey (Osmaniye). Lewis attended Louisiana Tech University until 2013 and it will be her fifth season in pro basketball. Let's have closer look into Her outlook: Named honorable mention all-state by the Louisiana Sports Writers Association. She graduated from one of the best programs in NCAA. She was 3rd scorer and rebounder and 1st blocker of La Tech in her senior season.Very athletic center /forward she can post and she is an efficient perimeter shooter and a reliable rebounder. She is a very good blocker and also one of the best seniors forwards in whole NCAA last year.